The photo above gives you a scale for some of the pieces. 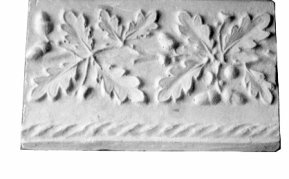 Several of these pieces were designed and modelled by the Arts & Crafts architect, Norman Jewson, with one or two by Gimson. 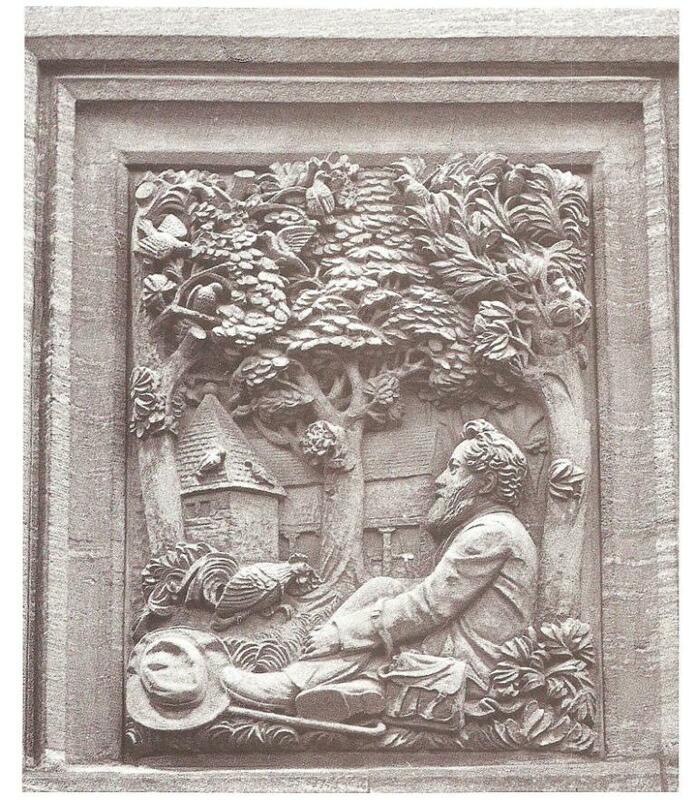 Jewson worked mainly in the Cotswolds, and practised many crafts, including stone and woodcarving, leadwork and decorative plasterwork. 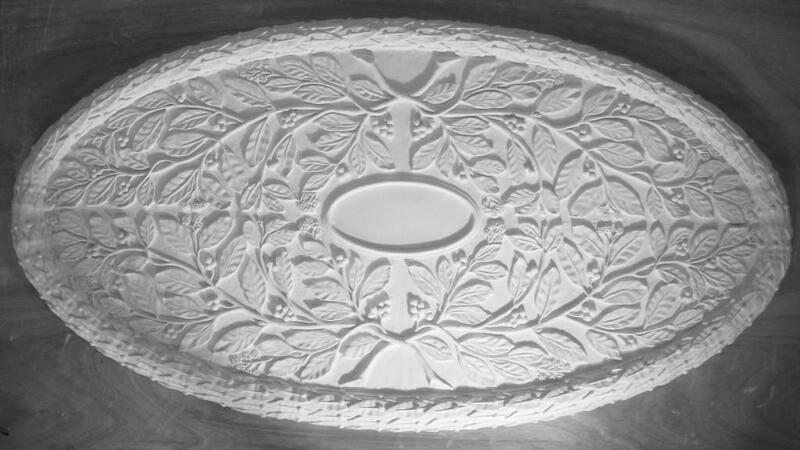 He trained under Gimson, and it was he who taught him how to produce decorative plasterwork. 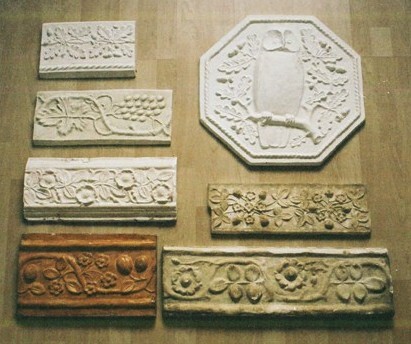 These pieces of plasterwork were copied from original pieces. 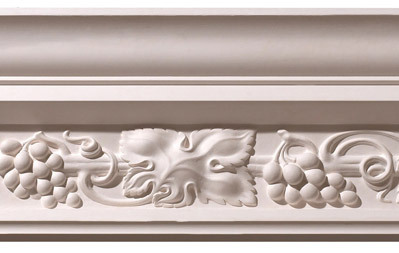 Most of the pieces are for friezes or ceilings. We can supply any quantity, and would be happy to quote for doing a room. £POA. These smaller panels have a different look and feel to standard lengths of plaster, but this tends to make them a bit more expensive (in man hours). We give the measurements for each piece. We have shown most pieces as a line drawing, rather than as a photograph, as this conveys the pattern better. Also, we have shown a cross section for each piece, the dotted line defining the raised pattern. 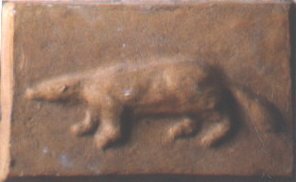 The Badger; originally part of a frieze design including several animals, it is now offered as a small plaque, with much charm. Supplied with a hook on the back. Size 21.5cm x 12.5cm x 2.5cm. £POA. There is also a small bird design we have from the same set. We generally only supply these with larger orders.